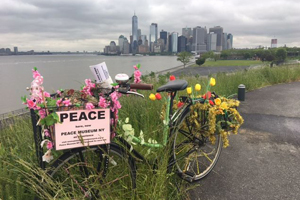 SPECIAL PEACE BIKE RIDE to Jacques Marchais Museum of Tibetan Art on Staten Island. Sunday October 21st, 2018. 10:30am meet up in Manhattan for 11 AM ferry at BICYCLE BOARDING SECTION of Whitehall terminal. Staten Island meet up 11:30am at BICYCLE BOARDING SECTION of St. George Terminal.